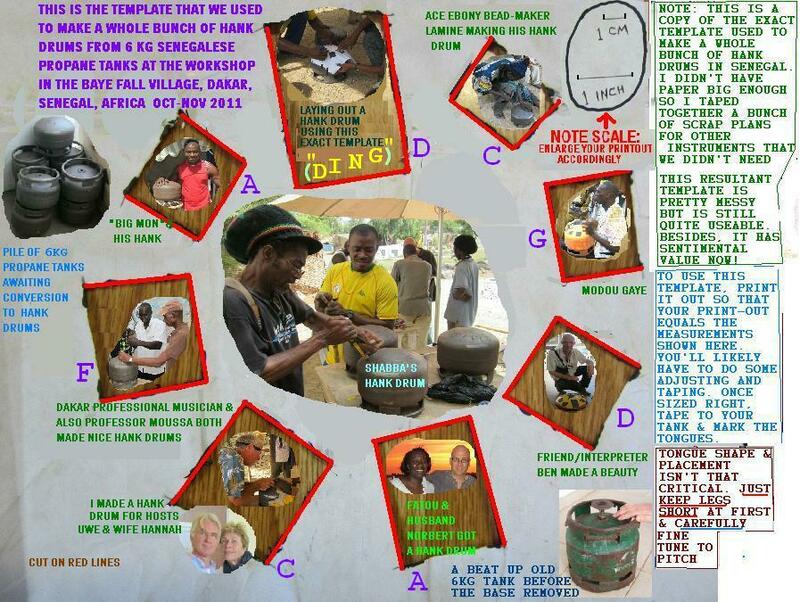 has made the use of my hank-drum building template & plans of limited use overseas. where, amongst other instruments, we made a lot of hank-drums. Turns out that these are 6 kg tanks with a steel thickness of .099 inches ( roughly 1/10 of an inch!). also used in France. Can anyone enlighten me on this?? Are these type of tanks used elsewhere in the world?? of these 6 kg Senegalese/French tanks. to allow fine-tuning with a bare fine-toothed hacksaw blade. bringing all the hank-drums into exact pitch - all using up only one 9 volt battery. of their simplicity, good sound, fun playing and ease of construction may well spread in Africa. Whether this comes to pass or not, the good folks of Senegal certainly did like them!